Snake oil is an expression that originally referred to fraudulent health products or unproven medicine but has come to refer to any product with questionable or unverifiable quality or benefit. By extension, a snake oil salesman is someone who knowingly sells fraudulent goods or who is himself or herself a fraud, quack, charlatan, and the like. It seems almost incredible, whatever their origin, that remedies of so offensive a character as many of those above given can still retain a place even in the rudest traditional pharmacopoeia, but there seems to be in the uneducated human mind a sort of reverence for or faith in that which is in itself disagreeable or repulsive. This idea apparently rules in- stead of rational judgment in the selection of many popular household remedies in the shape of oils of most loathsome deriva- tion, such as " skunk-oil," " angle-worm oil " (made by slowly rendering earth-worms in the sun), " snake-oil " of various kinds, etc. George Borrow, in that rare idyl of vagabondage, " Lavengro," tells of various encounters with an old herbalist who always car- ried on his back a stout leathern bag, into which he gathered not simples but vipers, whose oil he extracted for medicinal purposes. The faith of this wandering English mediciner and his numerous customers of half a century ago in the viper-oil is quite equaled to-day by that of American frontiersmen in the peculiar virtues of rattlesnake-oil. It is just possible that subtle remedial powers do exist in some of these oils, but it is not easy to ascertain why lard or olive-oil might not take the place of these disgusting un-guents. Fanny D. Bergen (1888). "Animal and Plant Lore II". Popular Science Monthly. Numerous supplement products have emerged in the market in the last ten years. They range from vitamins and minerals to herbals and hormones. This boom has created an uncertain situation as to the quality and safety of dietary supplements. According to Bruce Silverglade from the Center for Science in the Public Interest, 'the challenge for most consumers is to determine which supplements are beneficial and which are nothing more than 21st-century snake oil--or even dangerous.' That is why this legislation includes authorization of funds for physician and consumer education programs regarding adverse reactions. Congresswoman Susan A. Davis (October 28, 2003). "Dietary Supplement Access and Awareness Act". Congressional Record: p. E2150, Volume: 149. [Jack White] is the showman—the brassy frontman and the snake-oil trader. The Edge, from U2 (August 2009). GQ magazine. Stephen Fry (2010). "Last Chance to Think, Interview by Kylie Sturgess". Skeptical Inquirer 34 (1). Robert Heinlein (1973). Time Enough for Love. G.P. Putnam's Sons. ISBN 0-399-11151-4. Scientific American, in Lisa Hix How Snake Oil Got a Bad Rap (Hint: It Wasn't The Snakes' Fault), Collectors Weekly, 20 May 2011. Mr. Speaker, there is an old trick to hawking snake oil. First raise the fear. Then sell to it. That is exactly what the big- union, Washington-based labor bosses are trying to do with their latest advertising campaign of fear and blatant disinformation. Congressman Martin R. Hoke (August 1, 1996). "Congress and Medicare". Congressional Record: p. E1439, Volume: 142. Randall Jarrell (1953). "The Other Frost". Poetry and the Age. pp. 30–31. Snake oil analyzed shows that it is a bit more about enhydris chinensis, the Chinese water snake. Apparently, it is a rich source of Eicosapentaenoic acid (EPA), an omega-3 fatty acid, which the human body converts into natural pain killers, such as series 3 Prostaglandins. Heinz Kohler in: Caution - Snake Oil! : How Statistical Thinking Can Help Us Expose Misinformation about Our Health, Hillcrest Publishing Group, 2010, p. 12. In 1917, the U.S. government actually tested one of the bogus potions sold by Clark Stanley, the “Rattlesnake King,” and called Stanley's Snake Oil. it contained no EPA at all and consisted mostly of mineral oil and red pepper (with a tiny bit of beef fat, camphor, and turpentine thrown in), apparently similar to ingredients found in modern day capcaicin cream that is alleged to provide temporary arthritis relief. Interestingly, genuine snake oil is still sold in traditional Chinese pharmacy stores. A sample brought in San Francisco's Chinatown in 1989 was found to contain 75% of carrier material, such as camphor, and 25% of oil from Chinese water snakes, and 20% of that oil, in turn, was EPA. In the Middle Ages people took potions for their ailments. In the 19th century they took snake oil. Citizens of today’s shiny, technological age are too modern for that. They take antioxidants and extract of cactus instead. Charles Krauthammer (January 29, 1996). "Essay, The Return of the Primitive". Time magazine. . Also in: Tonya Zavasta Raw Food and Hot Yoga: From Severe Disability to Superior Health, BR Publishing, 2009, p. 81. That kind of politics has to stop. That kind of quackery has to stop. We don't need anymore faith healers and snake oil salesmen. We need some doctors to take the bullets out. Barack Obama (May 5, 2007). "Remarks of Senator Barack Obama to the National Conference of Black Mayors". Office of U.S. Senator Barack Obama. My dad's father was of Scots-Irish descent and a man of many hats. He was adopted by a neighboring family at the age of six after his single father decided to move on without him. As a young teenager, he ran away from the only real family he knew and set out to start a life for himself. I loved hearing his stories, some sounded like tall tales. Grandpa, a snake-oil salesman of sorts, rode the rails all over the country, selling anything and everything to earn a buck. Congressman Ted Poe (June 12, 2008). "The Fathers of the Greatest Generation". Congressional Record: p. E1216, Volume: 154. Well, he is on the recovery board, right? I guess two things. Caterpillar has also opposed the "buy American" provisions in the stimulus package. Recently a spokesman for Caterpillar said that they were like snake oil. And I know that the final package is still being finalized. But I'm wondering, that, and the fact that Caterpillar -- probably one of the companies that most supports the Colombia free trade agreement, and says that the stalling of that on Capitol Hill -- and I believe the President also has expressed concerns about that free trade agreement -- that that stalling is basically sending a message to businesses in Colombia, please buy Canadian products, not American. Does Caterpillar's support for the Colombian free trade agreement and opposition to the "Buy American" provisions, under the same idea of what's good for their workers and good business, would that have any effect on the President's thinking? Robbert Gibbs, exchange with Reporter (February 11, 2009). "Press Briefing". Obama Administration. 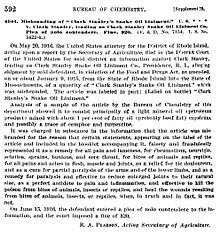 Clark Stanley reached into a sack, plucked out a snake, slit it open and plunged it into boiling water. When the fat rose to the top, he skimmed it off and used it on the spot to create 'Stanley's Snake Oil,' a liniment that was immediately snapped up by the throng that had gathered to watch the spectacle. Little wonder. After all, Stanley had proclaimed that the liniment would cure rheumatism, neuralgia, sciatica, lumbago, sore throat, frostbite and even toothache. Performed at the World Columbian Exposition in Chicago in 1893. Jon Stewart (March 12, 2009). "CNBC Criticism and Jim Cramer Interview". The Daily Show. Kurt Vonnegut (2005). A Man Without a Country. Seven Stories Press. ISBN 1-58322-713-X. Gandhi, Lakshmi (August 26, 2013). "A History Of 'Snake Oil Salesmen'". Code Switch (National Public Radio). Retrieved on July 6, 2014. This page was last edited on 22 February 2017, at 13:28.